The very fact that the Constitution of the Indian Republic is the product not of a political revolution but of the research and deliberations of body of eminent representatives of the people who sought to improve upon the existing system of administration, makes a retrospect of the constitutional development indispensable for a proper understanding of this Constitution. Modern Constitutions, apart from delineating the composition of the “State”, also embody the interface between citizens and the government. In this manner, the ‘bill of rights’ which incorporates the ideas of John Locke who argued in his 1689 work “Two Treatise of Government” that civil society was created for the protection of property & natural rights (which is Part III in Indian Constitution) has come to become a key feature of modern liberal Constitutions. that any province (or Indian State) which was not prepared to accept the Constitution would be free to retain its constitutional position existing at that time and with such non-acceding Provinces the British Government could enter into separate constitutional arrangements. But the two parties failed to come to an agreement. After the rejection of ‘Cripps Proposal’, various attempts to reconcile the two parties are made including the ‘Simla Conference’, but that too failed. But then somehow & the other the forming of Constituent Assembly became reality, but sadly the two nation theory also became reality. On 26th July 1947, the Governor-General announced the setting up of a separate Constituent Assembly for Pakistan. The plan of June 3, 1947 (i.e. “Mountbatten Plan” as to partition of provinces of Bengal & Punjab) having been carried out, nothing stood in the way of effecting the transfer of power by enacting a statute of the British Parliament in accordance with the declaration. With the enactment of the Indian Independence Act, 1947, two independent Dominions of India & Pakistan were created with effect from 15th August 1947. This Act also conferred full powers on the Constituent Assembly of each Dominion to frame & adopt any Constitution and to supersede the Indian Independence Act without any further requirement of any legislation from the British Parliament. The first meeting of the Constituent Assembly was held on 9th December, 1946. On 11th December 1946, Rajendra Prasad was elected as the permanent Chairman of the Constituent Assembly (however the first/interim President was Dr. Sachchidananda Sinha). Later, the Constituent Assembly adopted the “Objective Resolution” that became the Preamble to the Indian Constitution. It reassembled on the 14th August, 1947 as the sovereign Constituent Assembly for the Dominion of India. On 29th August, 1947, a seven member committee, the Drafting Committee was set up under the able guidance and leadership of Dr. B.R. Ambedkar. The most significant & historic moment for the Constituent Assembly was the mid-night session on 14th& 15th August, 1947. At this session, all the members of the Constituent Assembly took the pledge read out by its President. The Constituent Assembly of India assumed power for the governance of India & the Constituent Assembly endorsed the recommendations that Lord Mountbatten be the Governor-General of India (Independent India) from 15th August, 1947. On 29th August, 1947, the Constituent Assembly adopted a resolution by which the “Drafting Committee” was appointed. By October 1947, the Constitutional Advisor (Sir B.N. Rau) completed the task of preparing the first draft of the Constitution of India. The draft constitution as approved by the drafting committee based on the debates contained 315 Articles and VIII Schedules and the same was submitted to the President of the Constituent Assembly on 21st February 1948. After certain other developments, the draft was finally adopted in the Constituent Assembly on 4th November, 1948 that discussed the same in detail and finally adopted on 26th November, 1949. However, the text was considered by the Constituent Assembly on 14th, 15th & 16th November, 1949 that considered the motion of Dr. B.R. Ambedkar that the Constitution as settled by the Constituent Assembly be passed. The Constituent Assembly took total of two years, eleven months & seventeen days (2 years, 11 months, 17 days) to complete the lengthiest written constitution of the world & its labours are reflected in the twelve volumes of the Constituent Assembly Debates. Total of 2473 amendments were considered by the Constituent Assembly during this period. On 26th November, 1949 the President of the Constituent Assembly, Dr. Rajendra Prasad authenticated the New Constitution of India & fifteen articles of a provisional & transnational nature were given effect to, immediately on the passing of the constitution i.e. on 26th November, 1949 as enumerated under Art. 394. These provisions were Arts. 5, 6, 7, 8 & 9 (Part II i.e. Citizenship), Art. 60 (Ch. I of Part V i.e. The Executive under The Union), Art. 324 (Part XV i.e. Elections), Arts. 366, 367 (Part XIX i.e. Miscellaneous), Arts. 379, 380, 388, 391, 392 (Part XXI i.e. Temporary, Transitional & Special Provisions) & Art. 393 (Part XXII i.e. the Short Title, Commencement, Authoritative Text in Hindi & Repeals). The remaining provisions of the Constitution came into force on the designated day given under Art. 394 i.e. on 26th January 1950, the day India became Republic. The same day, the Constituent Assembly also ceased to exist and transformed itself into a Provisional Parliament of India till the first Parliament was duly constituted after the first General Elections in 1952 (Art. 379). 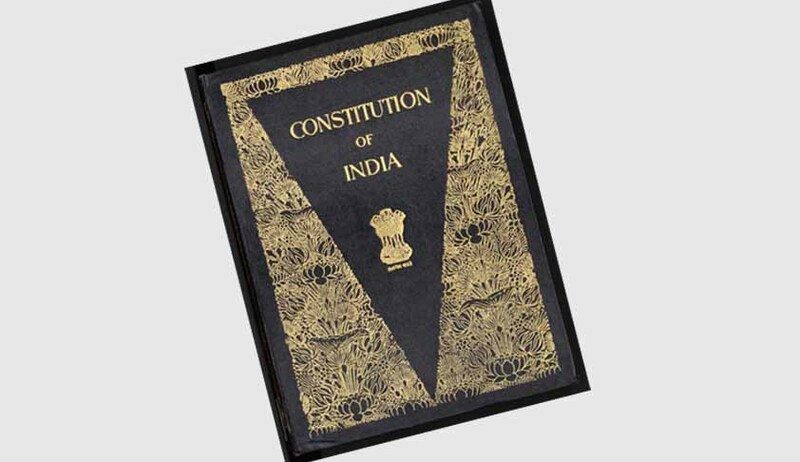 The Constitution of India consists of the Preamble, 395 Articles arranged in 22 Parts & XII schedules. Till now 101 amendments have been made to the Constitution. Let me put it like this, its “ We the people of India in our Constituent Assembly, this Twenty Sixth day of November, 1949, do hereby adopt, enact & give to ourselves this Constitution,” (which though had commenced on Twenty Sixth day of January, 1950) & declared that the objectives of the Constitution were Justice, Liberty, Equality & Fraternity. As a student of Constitutional Law I would say that the Constitution is not just a document, its a way of life. Its a way towards the progress of the nation, of the society & of the individual as a whole. Its a charter of the liberties & the desires. Its a document on which the pyramid of the Government is structured. And its because of these reasons the Constitution is the ‘Suprema Lex’ which is beyond the pale of any controversy. Its because of all these reasons all the organs of the State derive their authority, jurisdiction & powers from the Constitution & owe allegiance to it. This includes our hallowed Supreme Court. This Principle of supremacy was also reiterated by the Supreme Court of India in its several decisions, viz. Kesavananda Bharti case (1973), Indira Nehru Gandhi case (1975), Minerva Mills case (1980), Sub Committee on Judicial Accountability case (1991), Rameshwar Prasad case (2006), Raja Ram Pal case (2007). Mohit Sharma is a lawyer practising in the High Court of Himachal Pradesh, Shimla.